Duane raised the capital to launch and grow SunCommon and drove SunCommon’s dynamic culture and innovative marketing. He’s now responsible for investor relations, legal, HR — that’s Happiness Resources — and SunCommon’s new net-positive office building. He’s a social entrepreneur with an eclectic 35-year career in socially responsible business, campaign management, government service and community involvement. He moved his family from California in 1996 to Vermont where he worked as Chief of Stuff at Ben & Jerry’s for 12 years — getting to execute Ben Cohen’s creative vision. 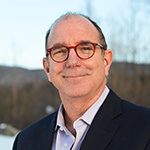 Committed to advancing values-led business models, he’s a member of the national Social Venture Network, Vermont Venture Network and Vermont Businesses for Social Responsibility. And he serves as a Director on the Boards of the VBSR and VPIRG. Duane lives in a newly-built net zero home in Waterbury Center with his wife of 26 years, missing their out-of-the-house 19 and 22-year old sons.